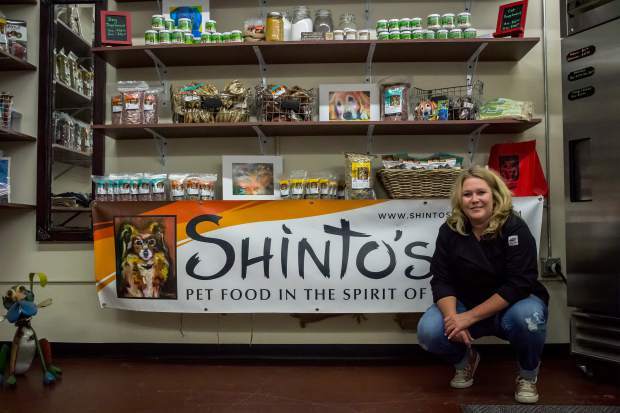 Lindsey McClerin founded Shinto's Pet Food in 2011 and opened her Grass Valley store in June of 2016. Grand opening/open house: Dec. 2. 10 a.m. to 1 p.m., critter pictures with Santa. 1 p.m. to 3 p.m., critter luncheon. 3 p.m. to 5 p.m., cocktails and appetizers for critters and humans. Tragically, McClerin lost her husband to a brain aneurysm, and from then on, Shinto remained a cherished link to the life she had lived with Kip. When Shinto was diagnosed with ovarian cancer at the age of 10, McClerin went on a passionate mission to do whatever she could to keep her beloved dog alive and healthy. With the famous words of Hippocrates in mind — “Let food be thy medicine and medicine be thy food” — she began researching the best possible nutrition for Shinto. She was shocked by the ingredients in most commercial pet foods, which are often full of preservatives and additives and lack basic, much-needed nutrients. 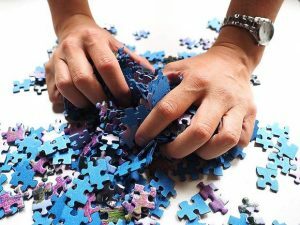 That was enough to motivate McClerin to begin cooking Shinto’s meals herself, customized to alkalize her dog’s system and increase her white blood cell count. Shinto went on to live for another six years. 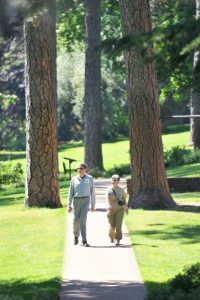 In 2010, McClerin moved to Grass Valley. She became a certified pet nutritionist and launched her business, “Shinto’s Pet Food” from her home in 2011. She started out selling her homemade pet food and supplements at the North Star Farmer’s Market in Grass Valley and was thrilled when she made $50 on her first day. But she quickly expanded and went on to sell her goods at 18 farmers’ markets around the foothills and Bay Area. That led to a host of wholesale accounts, and suddenly her house was full of coffin-sized freezers and chicken was cooking 24 hours a day, she said. When her new boyfriend, Justin Thacker, arrived to pick her up, he was stunned. A tile setter by trade, Thacker helped McClerin slowly begin to build her store and commercial kitchen on Joerschke Drive in Grass Valley. Determined to build it debt-free, McClerin would buy needed equipment and supplies during the months when sales were especially good. Friends and family would pitch in with construction to minimize costs. After five years in business, McClerin finally opened the doors of “Shinto’s Pet Food” in June of 2016, a true labor of love. In addition to her dog and cat food — cooked from scratch on site, she will be offering pet food cooking classes after the first of the year. 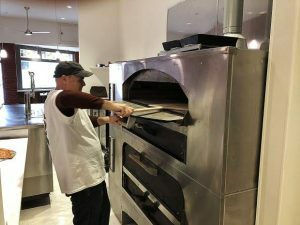 An official grand opening and open house is scheduled for Dec. 2, complete with pet pictures with Santa, a two-course meal for dogs (Angus tri-tip or chicken and turkey) and appetizers for humans. Examples of fresh-frozen wet dog and cat food dishes available at the gluten-free store include antibiotic free chicken and organic brown rice; free range turkey and organic brown rice, quinoa or steel cut oats; wild bison, liver and organic beets and more. Shinto’s whole food supplement includes 40 ingredients and is designed to purify and detoxify the kidneys, liver and colon; assist in oral health; help decrease inflammation; prevent urinary tract issues; promote healthy gut flora and more. McClerin said that all grains are sprouted, protein sources are raised humanely and only sustainable, organic produce is used. “To put it simply, we’re the BriarPatch of pet food,” said McClerin. Treats include chicken feet, pig’s ears (dehydrated on site), pork belly cookies, bone marrow bones, turkey liver jerky and peanut butter cookies. McClerin said the Sallots are now on vacation back east and have asked her to ship food for their new dog, Joe, while they are away.